One-of-a-Kind Architectural Masterpiece on 5 Secluded Acres in Sought After Oviedo...This Stunning Residence Designed by Award-Winning Architect and Owner and Featured in Numerous Magazines and Television Shows is a Must See! With an Open Floorplan and Easy Flow to the Outside Living Space this Home is Ideal for Entertaining Family and Friends...Built to NAHB Green Building Standards this Unique Home Features 4000+ sq ft of Living Space 4-5 Bedrooms 4 Full Bathrooms and 2 office or Flex Spaces. 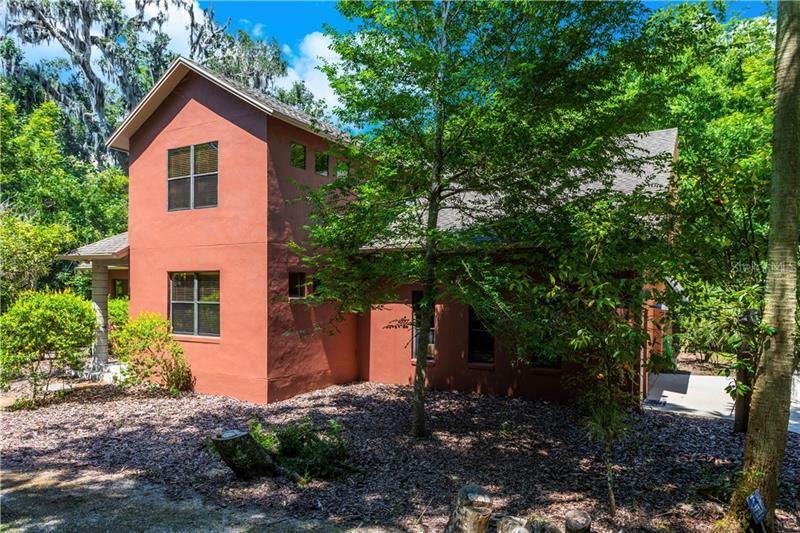 The Home Boasts Numerous Windows-Providing a Flood of Natural Light and Amazing Views of the Serene Wooded Nature Surrounding. Energy Efficient Double Paned Windows Kohler Fixtures Icynene Foam Insulation and Solid Core Doors are just a few examples of the Meticulous Attention to Detail that Defines this Home...Floors in the Main Living Area feature Sealed and Polished Concrete for Ease of Maintenance...Gourmet Kitchen the Heart of the Home Boasts Energy Star Appliances Solid Maple Cabinets Prep Sink with Pot Filler Solid Surface Counter Tops 20 ft Ceiling and more...Additional Features include an 80 gallon Solar Water Heater Central Vacuum Systen and Custom Built Garage Storage. This One-of-a-Kind Property has been Featured on HGTV In the New York Times and Orlando Sentenial and has Appeared in Several Magazines for its Exquisite and Unique Design...Bonus Feature:Top Rated Oviedo Schools Convenience to Shopping and Dining Options Expressways Major Employers and Orlando International Airport!